" The Rain Sensor is going to be an all or nothing setting. If you would like to utilize the Rachio’s settings for skipping runs based on Weather Intelligence, you can enable and disable this setting between schedules, but not Zones. I’ll be sure to pass this along to our team for review. If you’d like to get a conversation started with other users on the community, I suggest submitting a post through our Community Forum. This just allows other people to get involved and +1 your suggestion. We keep a close eye on our Community." So I guess this is me asking the Community to “+1” this post to move the issue to the front of the line for the software folks! Thanks for the suggestion @zmsp07 I’ll make sure our product team sees this! You cannot omit individual schedules from the physical rain sensor if you have one installed. This is a repeated request which makes sense for covered porch plants and greenhouses. Precisely. I live in the country, and the “weather intelligence” feature is useless to me because the nearest weather station might as well be in Timbuktu as far as accuracy in predicting whether I will get rain or not. Therefore, I HAVE to use the physical rain sensor if I’m going to avoid overwatering my yard. However, I cannot automatically “override” the “OFF” feature on the rain sensor for certain zones that still need to be watered even if the rain sensor is triggered. In addition to my situation, covered porch plants and greenhouses are good examples of where this feature would be needed as well (as scorp508 points out). From what I can tell, this has been an issue for a while now, and the product team keeps saying “it’s on our list of things to do, but it is not a priority right now.” Since 2015, Rachio has completely updated its user interface on my iPhone, and yet they can’t install a simple override for the rain sensor?!? I mean c’mon, I’m not a software guru, but I would think a software intern could bang it out in less than a week! DEAR RACHIO, LET’S MAKE THIS A PRIORITY NOW!! Sorry, for some reason when I was reading the post, I was seeing the rain skips in my head (weather intelligence). Carry on! Has there been any progress on resolving this issue through a software update? You could fix this with a wiring change. Instead of wiring the sensor to the sensor port, wire it in series with the common wire(s) for the outdoor stations. Then disable the sensor function in the software. Rachio, last I looked, doesn’t log sensor savings anyway. If your indoor stations share the same common as the outdoor, you’ll have to use a spare lead to give them their own common that goes to the rachio, not the sensor. Lars, this would not solve the problem. I need the rain sensor to remain active on a zone -by-zone basis. In other words, when the rain sensor is tripped, I would like it to shut off the watering schedule to certain zones (like my garden beds) but NOT shut off the water schedule to other zones (like the drip irrigation lines under my house - which need to remain on even during a rain because the moisture levels need to remain constant under the house to prevent the foundation from shifting). As it stands right now, I cannot bypass the rain sensor on a zone-by-zone basis – its an “all or nothing” system. This is a problem that has been flagged before (I’ve seen at least 3 other posts on this issue dating back several years). I would like Rachio to allow users to enable/disable the rain sensor on a zone-by-zone basis in their software to fix this long-standing problem. I think you can. Just take the zones you want on the sensor and give them the same common wire. Take that common and attach it to one lead on the rain sensor. Take the other rain sensor lead and attach it to the common connection port on the rachio. Take the zones you don’t want on the rain sensor and give them a different common wire. Attach that to the rachio common port. You’d end up with two commons. One switched by the sensor, the other not. When adding a new zone, use the common you need depending on whether the zone gets rain. Lars, even if that could work (and I haven’t confirmed one way or the other), it would be a ridiculous fix. I (and anyone else who has a similar problem) would have to re-wire our systems every time we needed to bypass the rain sensor. I bought my Rachio system (and spent a lot on it, I might add!) because of the promise of being able to change things “on the fly” with my iPhone. Why on earth would I want to brute force something that could be easily fixed with a software update?? You only need to do it once, unless your zones magically travel in and out of the house. Give it some thought. It is a very simple solution. I took a look at my Rachio box, and your “work around” is not feasible. I have 6 different watering zones under my house that I need to “bypass” the rain sensor. There isn’t enough real estate in my already crowded box of 16 different zone to “jump” wires from each of the six under the house to the common. So, again, the only real solution is a software solution. And to that end, I ask the Rachio folks who monitor these topics - when can we expect a software fix for this long-standing issue? All you need is one unused wire in your bundle that goes to the under house system and one extra wire nut. No jumpers as you put it. You wouldn’t be touching any of the zone leads. One thing worth trying is to completely bypass the rain-sensor and rely on the local pws data and IFTTT integration. The key to this is to keep the outdoor zones within one or more separate schedule(s). Note that only outdoor schedules (those which need to be effected by rain skip), should be mentioned within the Applet. You would need to create this trigger for each of your outdoor schedules (in case you have more than one). Remember to disable your old rain sensor within Rachio in order for this to work. P.S. Please let us know if it works in case you decide to try it. Gene, thank you for the suggestion, but as I mentioned in one of my first notes on this thread, I live out in the country, and the nearest weather station is so far away from me, it is not accurate to predict rainfall in my area. Lars, as I stated before, I don’t see a way to make the connections you are suggesting in my Rachio box. I appreciate that you are trying to be helpful, but I don’t think this is a realistic fix for me. 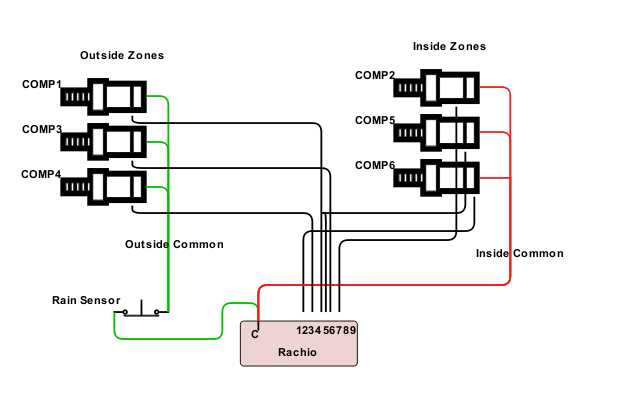 I just have too many zones to try and wire up. But thank you for the suggestion. So, I am right back to where I started. Needing a software fix. I guess I’ll just have to wait until the folks at Rachio deem this a priority and fix it. In the meantime, I’ll be disabling my rain sensor completely and just overwatering my lawn to make sure the zones that need constant watering get constant watering. So much for the Rachio being eco AND user friendly. Best of luck. I get it that wiring isn’t everybody’s thing. Unfortunately I can’t help on the software end so my stop gap solution is all I have. If you decide you want to tackle it or have a landscaper who can, post up a picture of your box with the wiring and I’m sure you could get some pointers. Finding the commons on the valve ends could be a pain depending how it is set up and a wrong move and you have nothing working.